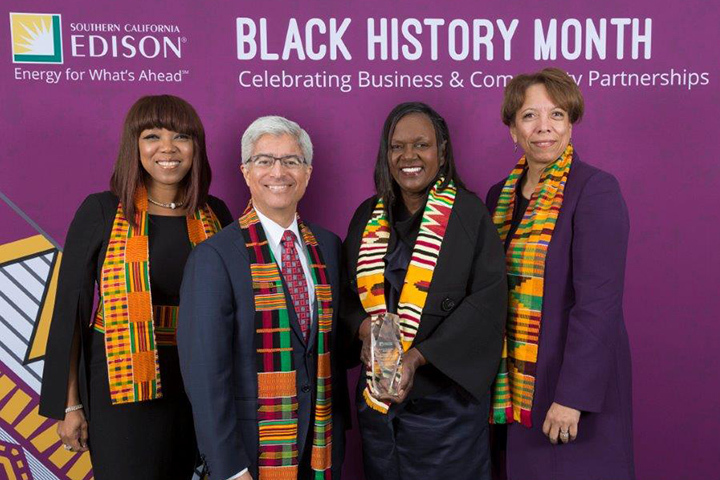 As part of the national celebration of Black History Month, Southern California Edison recently recognized Edison customers, businesses and community partners for giving back to their communities. Among those honored at an event in Compton was a former Long Beach Unified School District principal, Doris Robinson, for her work as executive director of the CSULB-LBUSD Math Collaborative. Robinson’s work also was featured last week in an article on the SCE website insideedison.com. The Math Collaborative that she directs in conjunction with Cal State Long Beach has been SCE’s community partner since 2011. The program helps African-American males, especially from North Long Beach, to excel and go to college, with an emphasis on preparation for science, technology, engineering and math (STEM). Edison International has supported the Long Beach Math Collaborative with $325,000 in grants since the program started. EXEMPLARY PARTNERS – Former principal Doris Robinson, third from left, receives a Community Partnership Award from Southern California Edison officials for her work as executive director of the CSULB-LBUSD Math Collaborative, which was established in 2011.